minxeats - recipes, recaps, and restaurant reviews: I Love Fall! Fall is my favorite time of year, and Fall means pumpkins. Orange has never been my favorite color, but I am very fond of the heavy-skinned and lobed members of the family cucurbits (thus pumpkins are cousins of cucumbers...also watermelons). They make festive decorations, singly or in groups, and the sight of them always reminds me that the long hot summer is finally over. Pumpkins play a part in my pantry all year long; there's always at least one can of solid-pack pumpkin and jars of pumpkin butter lurking. 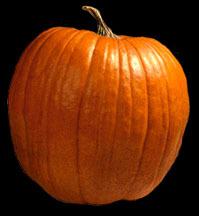 Apart from the standard pumpkin pie, I like to make pumpkin soup and pumpkin pancakes. In fact, the latter is what we had for breakfast this morning. Mix ingredients thoroughly. Ladle onto a hot, greased griddle by quarter-cupfuls. Cook until bubbly on top, then flip, cooking until nicely browned on both sides. Serve with real maple syrup and butter. I am not a huge fan of Bisquick, having eaten it for most of my life. It turns out dry, flannely, syrup-sucking pancakes, and does marginally better for waffles and the like. But I have found that adding an extra egg, plus a moist ingredient, such as pumpkin or applesauce, goes a long way in making the product taste...well...delicious!